The odd shaped door revealed steep, narrow, rough stairs that led to the most mysterious place this young girl had ever seen. Dim light filtering through a small, dust-coated window provided the only light until halfway up, when I could finally reach the long string attached to a single bare light bulb. 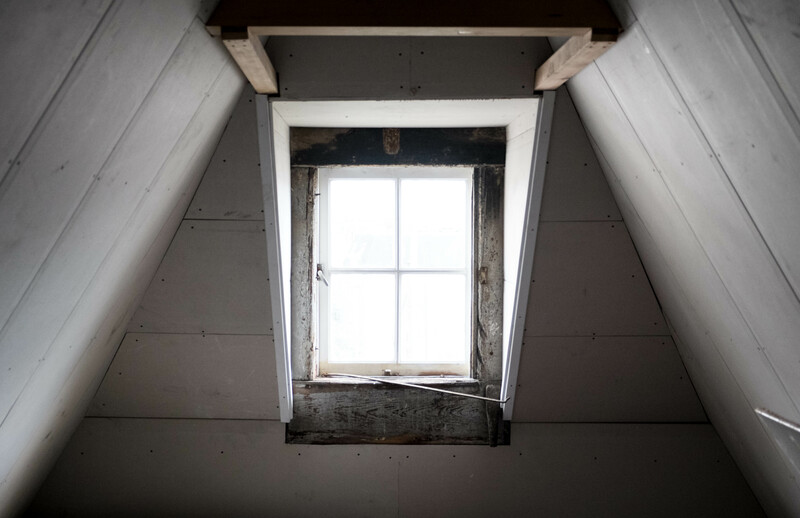 Emerging from the narrow stairwell, I stood in my grandmother’s attic, filled with treasures of generations past. Each trip up those stairs with my grandmother was an adventure. The house was a real log house with square, hand-hewed beams, built by my great grandparents, Homesteaders, part of the great Western migration. Although it had been remodeled several times by the time I first saw it, the attic was untouched. Gran always cautioned me to be careful on the bare, uneven floor boards. The main room was dominated by a grand bed and a bedroom suite long deemed out of date long before I was born. Above the bed hung an oval Victorian photo of a dour couple, some distant ancestors, uncomfortable in their finery. The dresser drawers had bric-a-brac that my small fingers longed to touch, but feared damaging. Farther along, a bookcase was filled with old hymnals and singing convention books. An old trunk contained fabrics of every description that I imagined had traveled vast distances. My grandmother later used many of these for quilts, and one of my greatest treasures is a butterfly quilt she made me. Plants that couldn’t stand the Appalachian winter were coddled in the warmth of a sunny window until they could return to their lives on the stone front porch. Other pots were nurseries for tiny new African violet plants that Gran loved to grow. Dodging out-of-season clothes hanging from a wire running the length of the attic, we could go into the back room. There, Gran showed me beautiful glassware, including some carnival glass that she remembered getting. I now have this glass. Unfortunately, I don’t have a real attic, and although I have many things from my grandmother, they aren’t quite right in my modern home. But they do make it home. 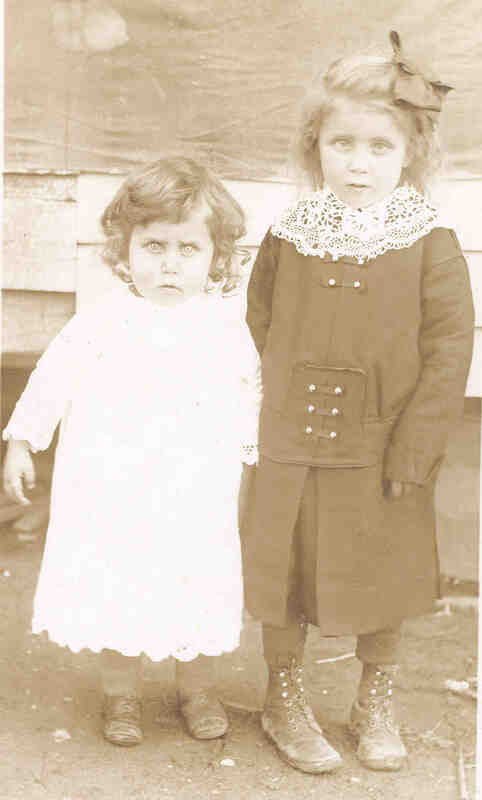 Below is a picture of my grandmother as a little girl with a friend. She’s the one on the left. How lucky to have these small treasures and sweet memories. I do feel so fortunate to have such vivid memories of my grandmother. You’ve painted a picture of the place, I can even smell it, though you didin’t mention that. I remember a line of clothes hanging in my grandmother’s attic, too, and beds. You are lucky to have these memories. I had a large attic in my last house and it was my doom – so much space to store things I should not have kept. But it was fun having my own attic with things like my grandmother had in hers. Nice post. Thank you so much for the comment! I was so focused on the visuals that I completely forgot to mention the smell; it was very distinct. I’m going to add something about it when I revise! I agree with Sky Blue Daze’s comment above — you’ve certainly painted a picture. I was especially drawn to the wood — the log house, the beams, the uneven floor boards under my feet. Thanks for creating these images and sensations as I read. Glad to see these words emerge from one of the four images. Cheri, The moment I saw this image, I was reminded of Gran’s attic and knew I had to write about it. Thank you for the comment! I just stopped by! I love it! I’m now a follower!